The REEL (or Reelout Entertainment and Educational Library) is located at 844A Princess Street (HARS). Our library acquires queer, Canadian and international film and/or video on DVD format for the purposes of fostering gender and sexual diversity education to citizens of Kingston and Lennox, Frontenac and Addington counties who lack accessibility to these resources or may feel isolated from queer culture, or may wish to increase their awareness of GLBTTQI issues. 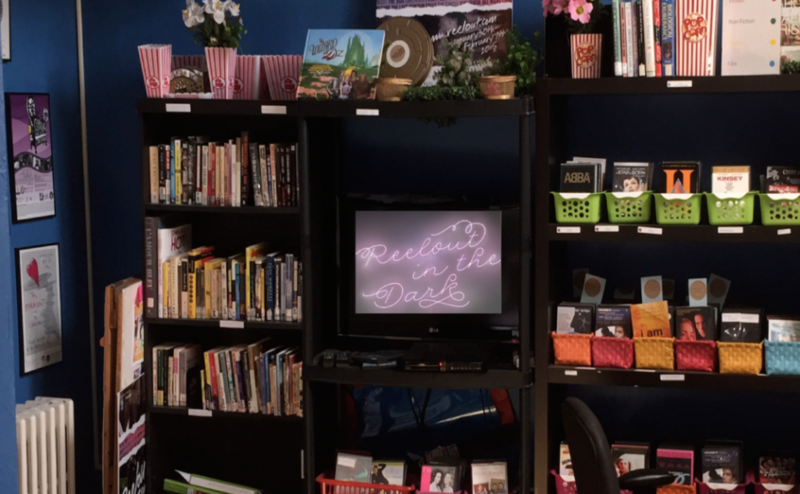 Membership to Reelout Arts Project is $20 annually or $40 for agencies/organizations and allows you as a patron access to over 500 DVD titles ranging from documentaries, short films, dramas, camp/cult classics, to iconic examples of queer representation in Hollywood cinema. We also have a small collection of LGBT/Film related books and our reading collection can be found on our Goodreads page or you can download a PDF listing of books available. The library is open by appointment. Call (613) 549-REEL for more details. You can also check out Classic Video on 40 Clarence Street for any LGBT titles you may be searching for – they have a very large PRIDE section. You can call Classic Video at (613) 542-3900.